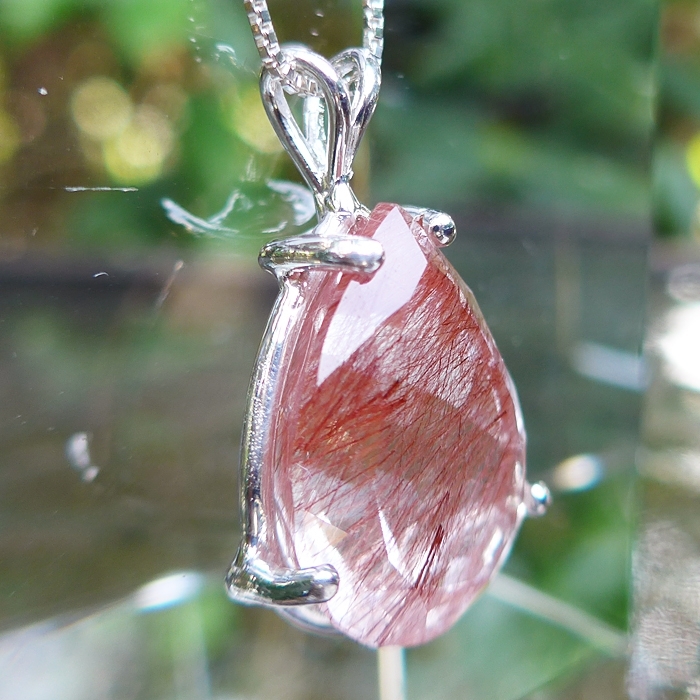 Dimensions (HxWxD): 1.25" x 0.75" x 0.5"
This stunning 1.25 inch high, 30 carat AAA Red Rutilated Quartz Teardrop Pendant contains deep red colored needle-like inclusions of titanium inside it. The surface of the stone is flawless, and features faceting front and back that gives it real bling. 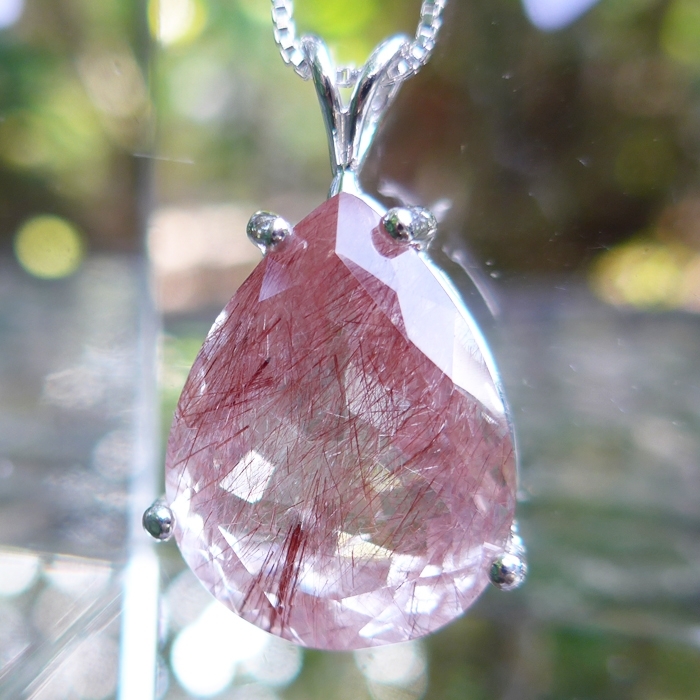 It is set into a sterling silver bezel setting which allows the stone to breathe, and hangs on its sterling silver chain right on the thymus between the throat and the heart chakras, offering protection to the whole body resonating through the compassionate heart. This pendant comes in its own velveteen jewelry box for safe keeping. 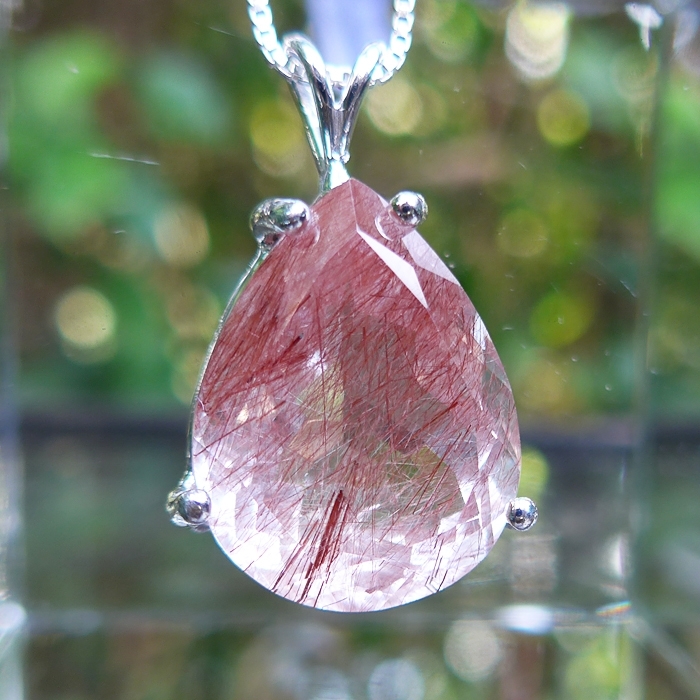 Red rutile activates and energizes the root chakra, enhancing the flow of Universal Life Force energy throughout body, mind and aura, and imparting an increased sense of personal power and well-being. Rutile is a titanium ore. Titanium is used in high tech and aerospace alloys because it’s a lightweight super-conductor of electrical energy, exhibits great tensile strength and resists corrosion. Read more about rutilated quartz and other types of quartz crystal at the SatyaCenter.com Crystalpedia. Note: Above weight is shipping weight, actual weight is .3 oz. excluding chain.